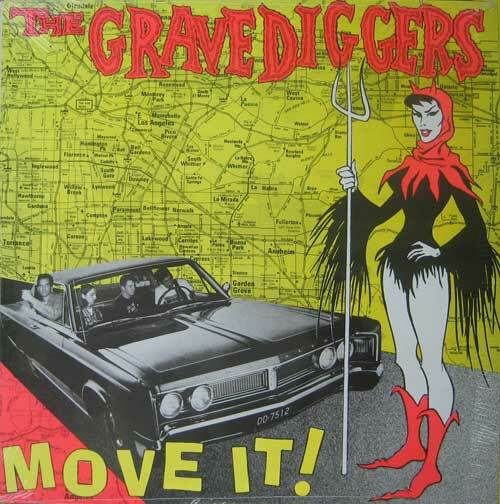 Jorge Sectmaniac messaged me yesterday with what I can only describe as the herald o' an Angel: Crypt Records has re-issued the world-famous Grave Diggers 1989 alboom, "Move It!" with swank, deluxe gatefold sleeve with extras galore!! 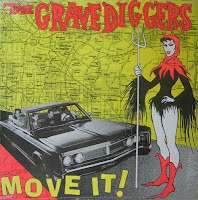 Here in Wiggyville we celebrate this ineffable occasion by playing some of the tracks that the Grave Diggers covered on said album. You get yerself The Phantom beggin' Love Me; The Ricochets (aff) saying Hey Girl; the immortal (that's what the album sez) Jay Blue hollerin' Get Off My Back; Tooter Boatman conjurin' up Thunder and Lightning; guitar savage Link Wray with an instrumental so provocative it was banned, Rumble; and The Trashmen with a tear-up version of Ubangi Stomp. And that's yer Six Pack o' POUNDERS fer this commute buster!! Oh... we may have an extra can o' pop in here somewhere, too. Tune in to find out with the options below, pally. Make sure to download and listen to RadiOblivion No.26 where I have Jason (the) Goodman of the Grave Diggers in studio.